Which Tomato is the Right Tomato? There are six different types of tomatoes to eat, and they vary in taste. Learning about the different types will help you choose the right one for your next recipe. This miniature tomato comes loaded with nutrition and flavor. They resemble a cherry but are the color of a tomato. When eating this type, you will immediately notice how sweet it is, compared to other varieties. They are perfect for a salad or to enjoy on their own. Globe tomatoes are the ones that many people think of when they hear tomato. Many supermarkets call this type beefsteak or slicing tomato. These have a subtle flavor and aren’t as juicy. They are great for recipes in which you want a fresh tomato taste without it overpowering the rest of the meal. 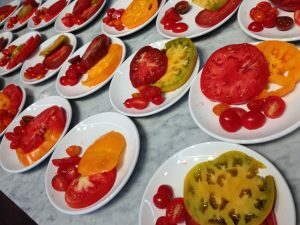 Whenever gourmet chefs cook with tomatoes, they often choose the heirloom variety because they have a juicy, strong taste. These are the most flavorful, so it’s best not to use too many of them in a recipe unless it’s for a tomato dish. These tomatoes are not as common, but people still use them quite often in salads or eat them by themselves. They are shaped like a pear but are only the size of a cherry. These oval shaped tomatoes taste similar to the cherry variety but are just a bit bigger. People usually use them in salads, but they cut them in half. They aren’t as juicy as cherry tomatoes, so they don’t get as messy when cut. Roma, or plum, tomatoes are not juicy, and they have fewer seeds than other types. People use these tomatoes for Italian dishes. If you want to prepare a salad, cherry, grape, or pear tomatoes tend to be the most popular, but you can really use any type. Although, if you choose to use a bigger variety, be aware that there will be more cutting or slicing involved. When cooking, use globe, heirloom, or Roma. For a strong flavor, use heirloom or Roma. Use globe tomatoes if you want a mild flavor. This, however, does not mean you can’t use cherry or grape tomatoes in cooking. For example, if you cut grape tomatoes in half and saute them in some olive oil, garlic and chopped basil, you will have a very tasty bruschetta-like topping or sauce! The quick answer is in any way! Tasti-Lee tomatoes are vine-tomatoes, ripened by Mother Nature. They are perfect for sandwiches and other fresh dishes but also work well cooked! Perhaps roasted? If you’d like to take a look at some Tasti-Lee tomato recipes, visit http://tastilee.com/recipes.php.